Btw, the article says that Sawaii chan "Previous work included fashion magazine appearances and work in commercials, including one for Tokyo Disney Sea." Where can I find that Disney commercial?? I haven't checked it myself, but maybe you can try finding it on TDS' site? Then try searching it on YouTube. I think that the girls will never forget their time in pgsm...frienship forever! !...and I will never forget them!! I think that the girls will never forget their time in pgsm...frienship forever!! I'd guess they'd still be together even when they'd become grannies. ^ Posing w/ a famous Chinese dumpling dish. 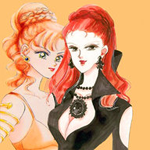 While the five Senshi girls are all close, Mercury & Jupiter have always been particularly so ever since their PGSM days. 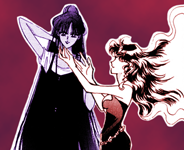 Oh...Mew and Rika are soo lovely and pretty!! I m pretty sure that the friendship between the girls in pgsm will be forever!! Mew chan is soo pretty!!! I love her wet hair!! BTW, can't believe Keiko's hubby is already 40 - he always looks pretty young to me. Oh my...thanks for the info, Rika!! I guess that I will never be tired of see the 5 pgsm girls togheter!! Sawaii chan, Keiko chan and Ayaka chan looks AWESOME!! ^ She's now a pretty mature woman. Wow...Sawaii chan still has her Luna and Artemis plushies?? I think that Ayaka chan still keeps her Artemis plushie...soo cool! !